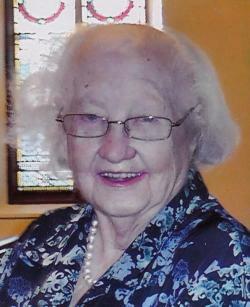 It is with deep sadness we announce the peaceful passing of Sybil Constance "Connie" Milner, age 92, of Sackville, NB. Connie passed away peacefully in the Sackville Memorial Hospital on Friday, January 25, 2019. Born in Sackville, NB, she was a daughter of the late Nelson and Hepsy (Wheaton) Milner. She had been a longtime member of St. Paul's Anglican Church and the ACW. Connie started working at the Marshlands Inn under the direction of Herb and Alice Read Senior and became a faithful and cheerful employee for over 40 years. A highlight of her time at the Marshlands Inn came when she was chosen to greet and serve Queen Elizabeth II on the occasion of New Brunswick's Two Hundred Anniversary, September 24th, 1984. She thrived on being a part of the "Golden Girls" of Mel's Tea Room, which was a special place to them all. She had a vivacious and bubbly personality and will be missed by those who knew her. She will be dearly remembered by sister Mary Jo Smith, Trenton, ON; sister in law Shirley Milner, Toronto, ON; as well as many nieces, nephews and great nieces and nephews. She was predeceased by brothers David "Bud" (Marg), Robert, Alan (Phyllis); sister Dora (Ronald) Burgess; brother in law Conrad Smith. Arrangements are under the care and guidance of Jones Funeral Home, 70 Bridge Street, Sackville, NB (506-364-1300), where visiting hours will take place on Wednesday, January 30, 2019 from 2 to 4 and 6 to 8 pm. Connie's funeral service will be held on Thursday, January 31, 2019 at 2:30 pm from St. Paul's Anglican Church, Canon Kevin Stockall officiating. Connie will be interred beside her parents in the Sackville Cemetery in the spring. The family would like to extend a special thank you to Stella Dawe, Doreen Henderson, Florence Estabrooks, Pat Cormier and many friends and acquaintances for their kindness to Connie over the years. The family also wishes to express their sincere gratitude to Dr. Cory Long, Dr. Catherine Johnston and nurses for their compassionate medical attention and to the Autumn Lee Retirement Home for making Connie's stay there so pleasant. Donations in memory of Connie may be made to the charity of your choice. Sharing of memories and condolences may be sent to the family by visiting Connie's online memorial at www.jonesfuneralhome.ca or through the Jones Funeral Home Facebook Page.